The winter is dragging on here in the North East, freezing rain and even snow flakes keep looming in the weather forecasts. The grey of winter hangs over us still but there is one flowering bush that will not be stopped....the forsythia! The forsythia has been holding on to its tight yellow buds for weeks just waiting for literally "a ray of sun", to set their buds a blaze....the forsythia waits no more! Despite all the terrible weather and the ridiculous temperatures that have dominated the early spring in the Boston, and New England areas, the forsythia is peeking through! The yellow flowers can be seen in corners of yards, dotted along roadways, and hugging foundations of garages, and homes....can I just say hoary for the forsythia!!! It is evident that Mother Nature runs the show, she dictates your daily attire, your outdoor plans...April school vacation plans, exterior painting ,roofing and yard work, airline flights, and driving can all be changed with the weather, Mother Nature definitely holds the economy in the palm of her hand and no one can change that! I feel that Mother Nature smiles with forsythias, she is grinning now! The forsythia are showing their color, a sign of hope that soon Mother Nature will spread her sunshine arms and she will outright laugh in flowers! I choose the forsythia as the plant of the week, just as I did so many years ago. It is the welcome banner, the calling card, the embrace of spring that we all wait for here in the north east; the budding and blooms, of the sunshine, golden-yellow, forsythia! I selected the Forsythia as the very first plant of the week because, I love it! 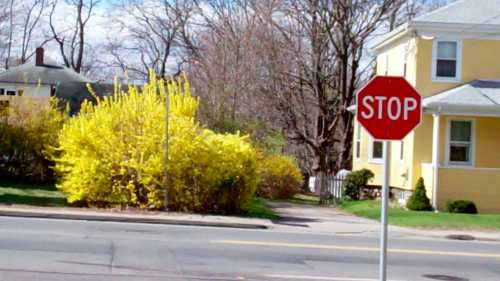 I especially love a “free forsythia”; a wild untrimmed, untamed, forsythia bush! There is nothing like coming upon a forsythia, all natural, spewing up in all its golden glory!!! I would like to start a free the forsythia campaign. Don’t trim it, or shape it, don’t form the wild child into a little yellow gum drop shapes, just set it free! Don’t manicure your forsythia! I do understand… that there are sometime space constraints, and formality, where the unruliness of a free form forsythia is just not permitted, I do accept that….but I always think that trimming back a forsythia is like braiding Shirley Temples hair! The photo above is amazing, it is almost a though it had been planted, and staged just for me! Two yards, side by side, forsythia planted as a property division, one homeowner sets the bush free and one trims it all proper. The stop sign, across the street, perfectly placed, to give pause, to the choice of weather prune or not.....I could not have created a better scenario! The decision is yours, to prune or not to prune! 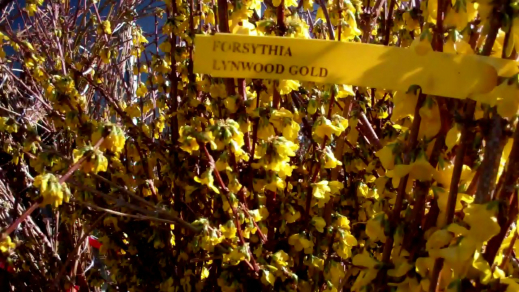 The forsythia is my plant of the week! Forsythia will grow in sun or shade, but the more sun, the more flowers. 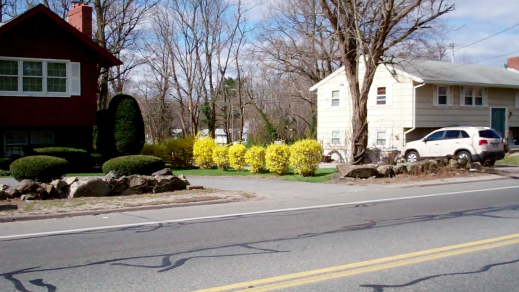 Forsythia is a great deciduous screen, or privacy hedge. Forsythia can propagate from cuttings. Forsythia grows well in moist, wet areas or dry areas as well. 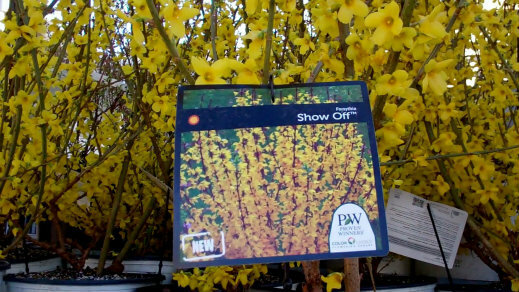 As much as I love the fabulous forsythia, the Proven Winner Series of shrubs has developed a perfectly polite forsythia“The Show Off”, it is spectacular! Blooms from the ground up. Stays compact, and under control. Has a long bloom time. Give forsythia a chance in your yard, plant a row, or plant one, prune it or don't prune it....believe me, after a long, long, New England winter, you too will love the announcement of the Spring the forsythia shouts!!! Whats your favorite sign of Spring? Let us know, show us, we are waiting to hear!! !